The Quimper Hitty’s human bought a beautiful hand made basket on our recent trip to the Ozarks. It is made of split branches, with a wooden base and compartmented interior. There are two handy inset magnets, useful for holding scissors or a darning needle! We are using up two balls of yarn to make these Hitty sleeping bags, and with each in its own compartment there is much less tangling! 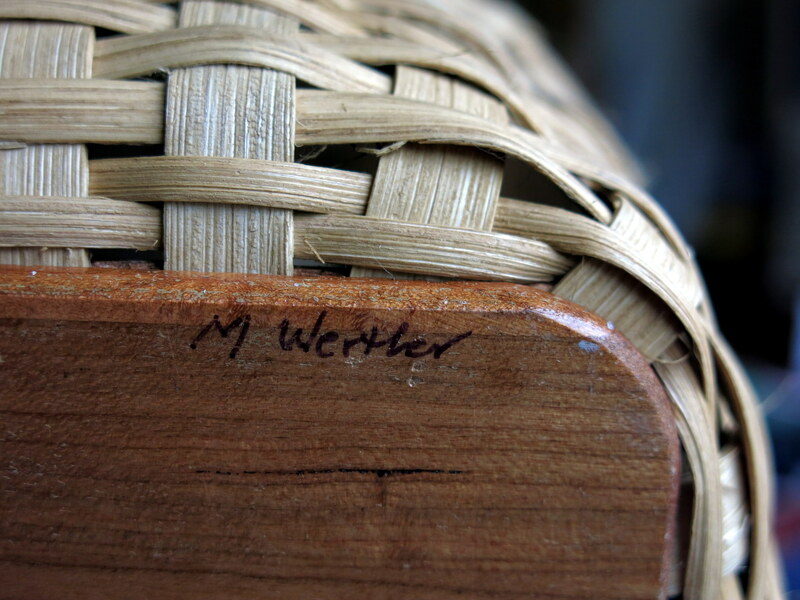 This is the maker’s signature, but we couldn’t find out anything about her…the basket was purchased at Lillie Hobbs Mercantile in Omaha, Arkansas. Rose thinks the beautiful workbasket will probably extend its magic into the rest of the workroom and everything will become organised! Beautiful basket. A basket somewhat like yours lives at our house. 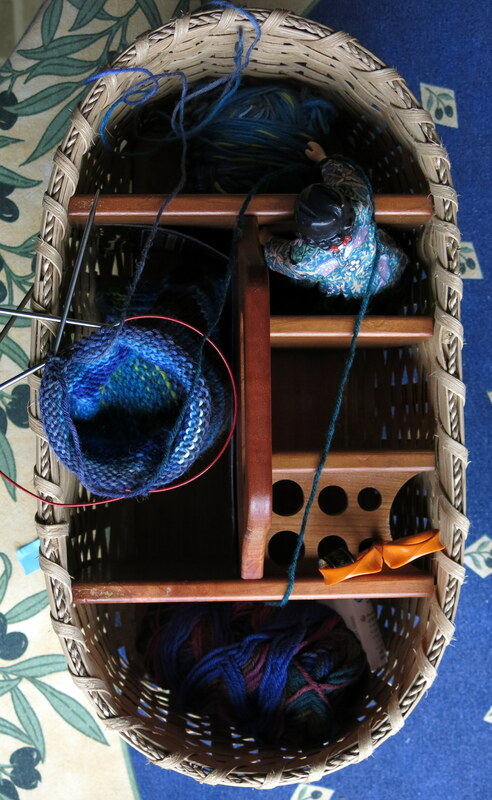 Our basket is a rug hooking basket. The round holes hold the different hooks . It is a wonderful basket! I am sure many beautiful rugs spent time in your basket! 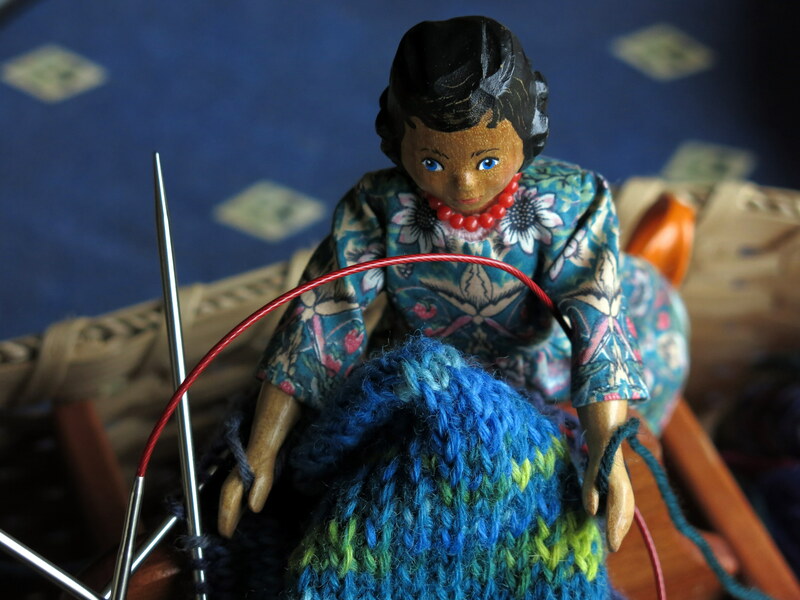 How handy that basket looks…especially suited for a knitter’s needs? I’m glad you’re feeling (or…Rose is feeling) that it will extend it’s organization farther afield. 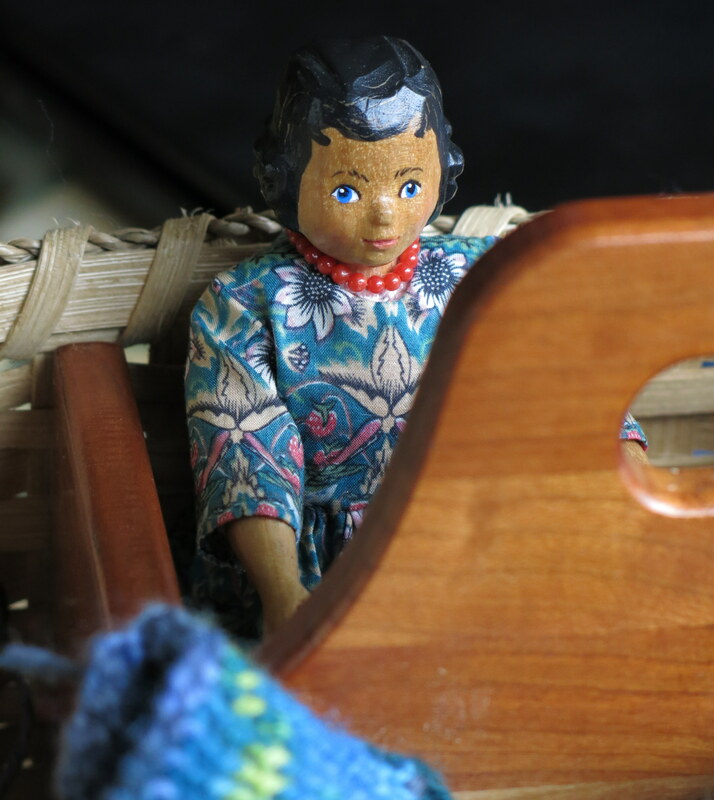 I think it could be a useful basket for organizing lots of different kinds of projects…most of the Hittys think it would best be employed as a doll carrier! I got to see that marvelous basket in person. It is indeed lovely and now it has a great home with the Quimper Human and Rose!! those magnets are sooo clever! We love to see old technologies re-imagined …I m sure that I will now lose track of fewer needles! There is nothing so satisfying as a functional art form. 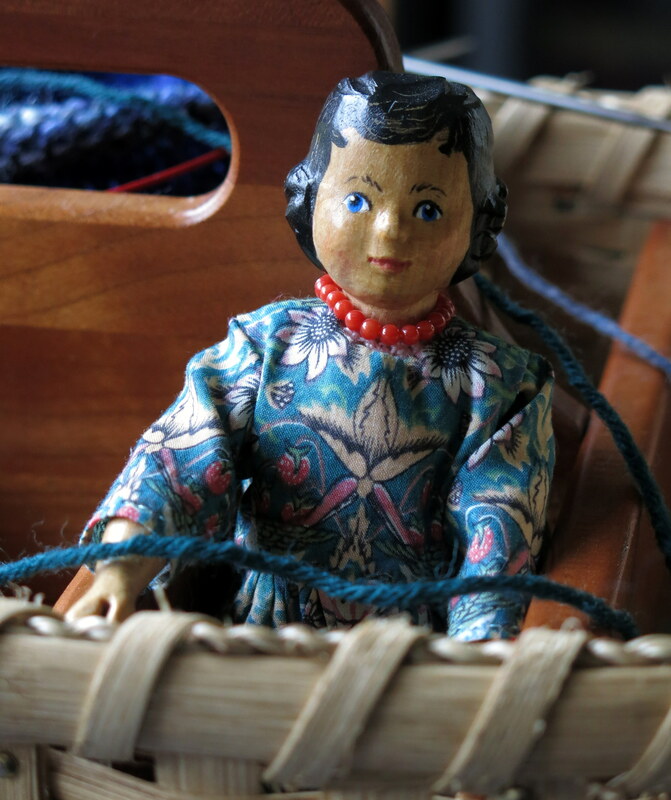 Knitting, quilting, baskets, candles. “Old technologies reimagined” is the perfect phrase. I agree! I am happy that making beautiful useful things is still an important part of some people’s lives… and that younger people still want to learn how! How very beautiful the work basket is! When I see something functional, made with so much care and from natural materials, I mourn the invention of plastic and the resulting decline in craftsmanship. But we do seem to be living in a time when it is returning. The basket looks as though it might be spacious and well designed enough to become an entire workbook for an industrious little Hitty lady, too! 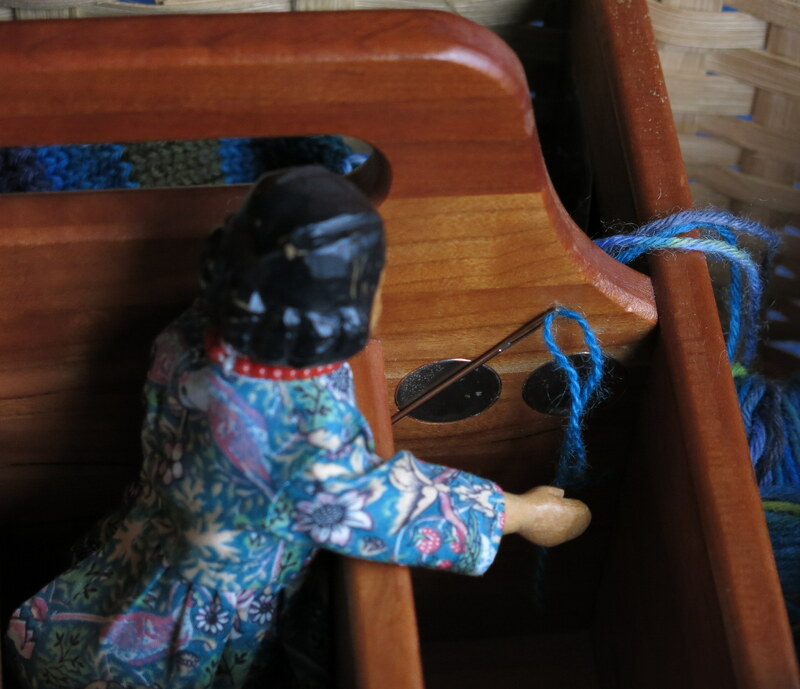 I was very glad to see that there were slots to accommodate small wooden encouragers as well as compartments for wool, scissors etc. – Rose was too! We thought it was an excellent basket, I am absolutely certain it will help with organizing!